Have you been following along? Yay, if so. Well here is Part 4 in my blogging series. I have been sharing my inspiration and design ideas for a beach house. Today I'll be blogging about how I would design our master bedroom in our "pretend" beach house. First I would have my handy hubby or a local contractor add panel molding to the walls in the room, like the mood board photo below. Then I would paint the wall color, including the trim, a really chalky, pale coral. I think one of these colors from Sherwin Williams would work really well. 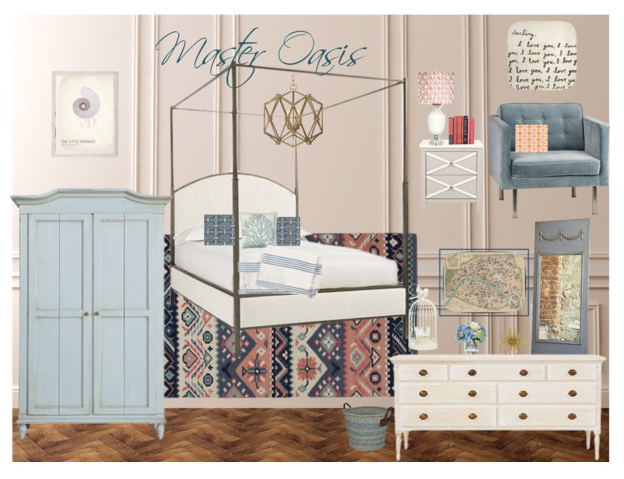 I really want the master bedroom to have a sophisticated feel, with a little whimsy, and of course be comfy. I love the soft color pallet of corals, mixed with blues and grays. And I am a big fan of the brass accents. What's old is new again, and yes brass is back! So here are the details on the bed. 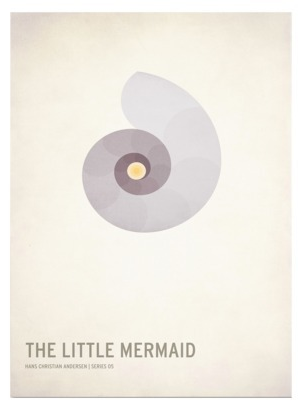 You can find this one at Ballard Design. 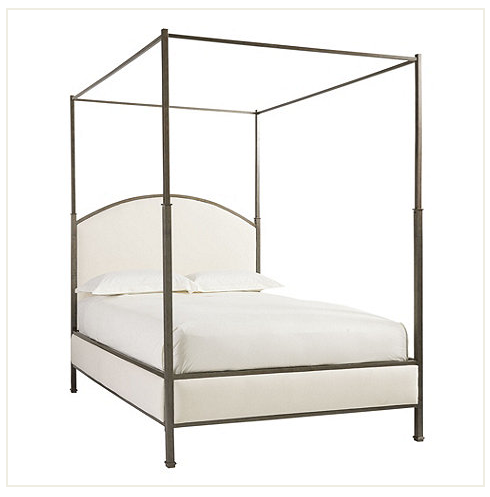 You are able to custom design this bed, with a variety of fabrics, but I just chose a simple off white linen. I would keep the bed linens simple, and just use an off white, duvet and pillows. Then I would accent with a few fun pillows like these. 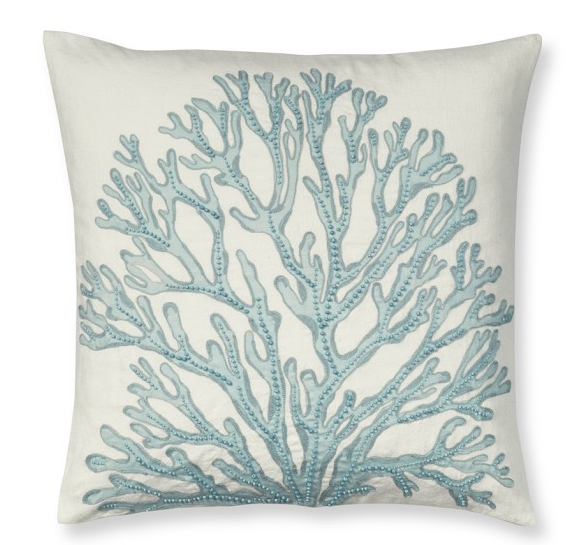 The first pillow is from Williams Sonoma, and I love the coral detail on it. I actually have similar pillows on our current master bed. I found the fabric for these pillows at Hawthorne Threads. I love the navy, with the corals and aqua. 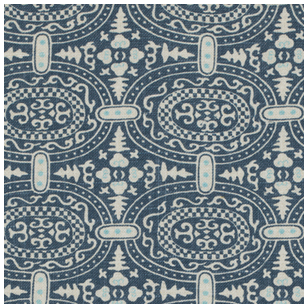 It's an Amy Butler fabric, she is one of my favorite fabric designers. 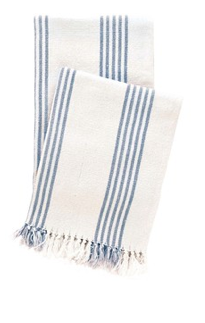 I chose a simple throw, that has a pillow ticking feel to it. Something about pillow ticking always reminds me of the beach. So there is the bed, and the bedding, pretty simple, yet comfy and inviting. Just what I would invasion for my master bedroom beach house. Here are the details about the furnishings I chose for the space. 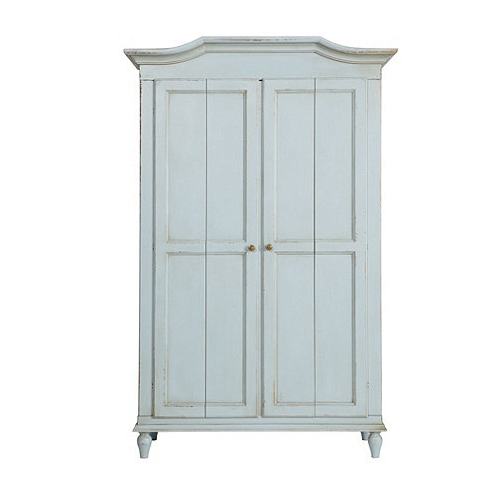 I love this tall armoire from Ballard Design. They have a great collection of painted wood furniture, with lots of color options. I just happen to adore this bluish, aqua finish. This would be a perfect place to tuck away a TV, and have additional storage. 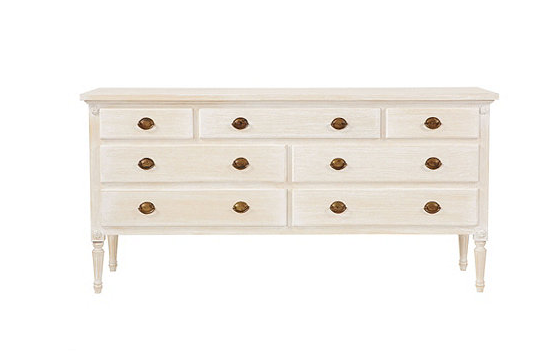 Next I found this long dresser, that I think would be nice. I do not like when furniture all matches, I think it great to have different colored finishes, and embrace the eclectic look. 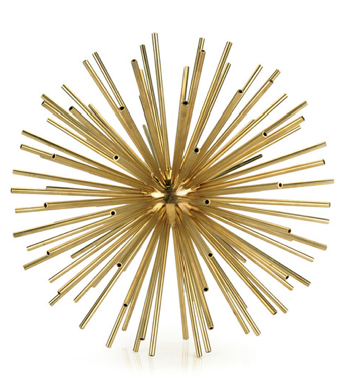 This piece is also from Ballard Design. The side tables are from Layla Grace. I love the X pattern on the front. I would add two of these, one on each side of the bed. 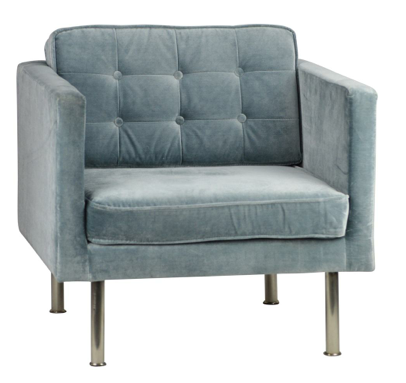 Oh how I love this velvet chair. I looks comfy, vintage, and modern. I think it's the perfect combination. I don't need a new chair for our current home, but I sure do love this one. :) You can find it here. Now for all the little details the make a room. 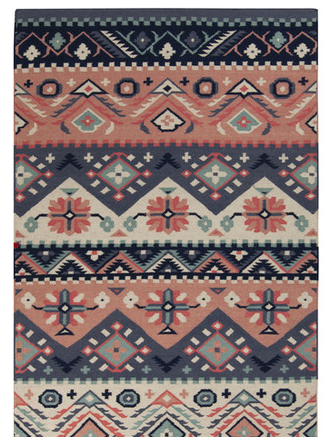 I found this rug online at Wayfair. This rug has my favorite color combination. I think it's what pulls the color story together in this room. 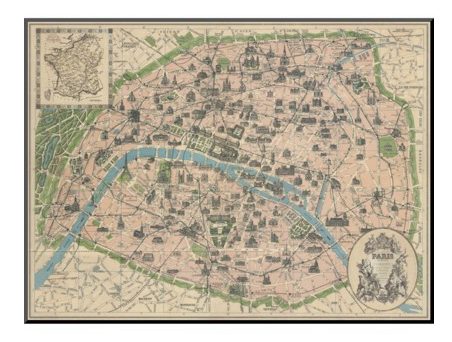 This Paris map can be found at Target. I love how it looks like an old vintage map, but does not cost a lot of money. You could frame it yourself, and save some money. I always have luck with large frames at Michael's Crafts or Hobby Lobby. 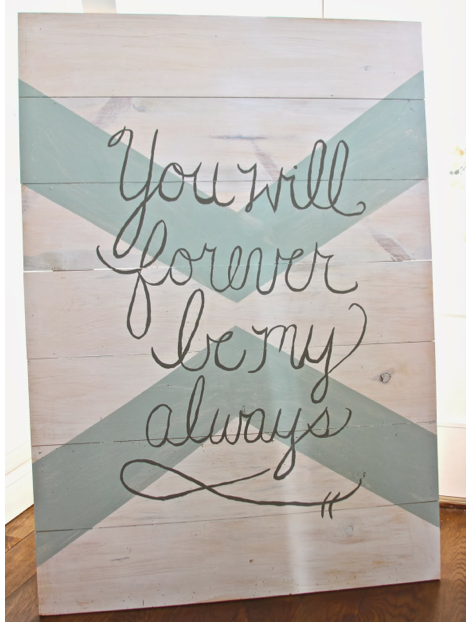 Another great artwork piece I would use in this room is this painted wooden sign. 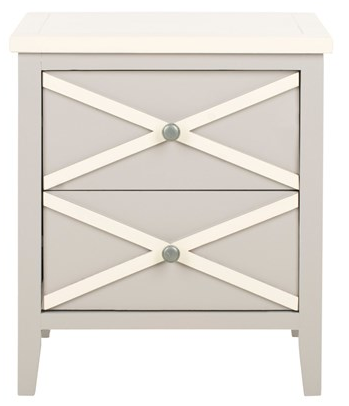 A local boutique in town Dress and Dwell carries this Sugarboo line. I think it's always great to have a meaningful piece of art in your master bedroom. You could also create a piece like the one I made here. This is another great art piece I found online at Target. It works well in a serene beach inspired space. 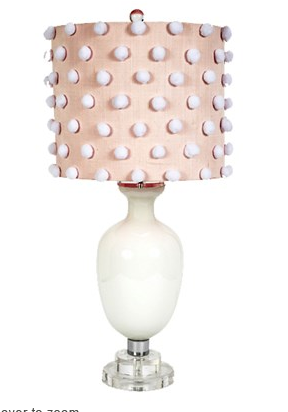 Loving this fun and whimsical lamp by Layla Grace. I would put them on a bedside table. I may try to emulate this lamp shade. I think it would be easy to make by gluing pom poms on to an existing lamp shade. 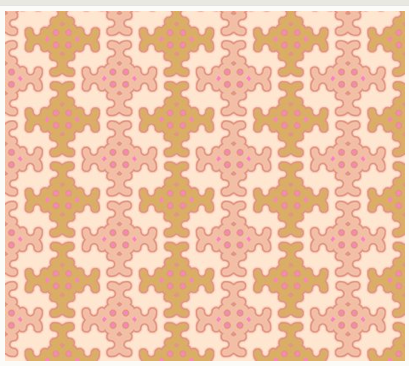 I would use this fun little modern print fabric for an accent pillow. You can find the fabric here. 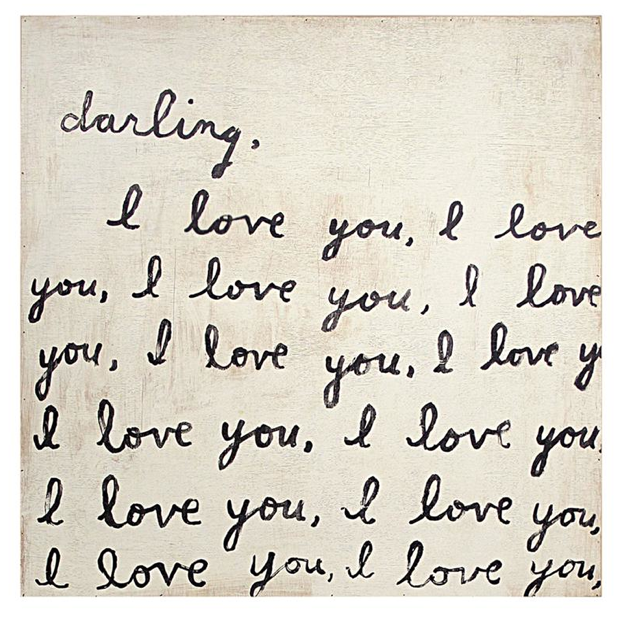 Lastly, I saw a similar piece to this one, at Target recently. I think it is a perfect little accessory to any room. Brass accessories are really on trend.